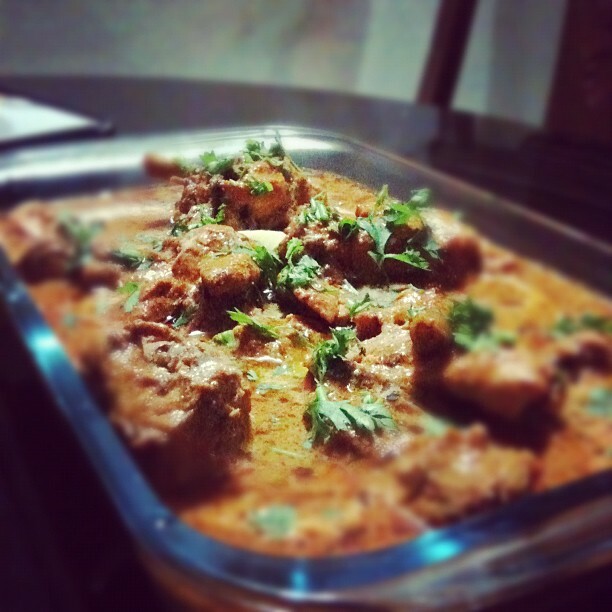 If I had to state one particular recipe which has wow-ed the people I cook for the most, then I would have to say that it’s my version of Sanjeev Kapoor’s Butter Chicken. This recipe has never failed to impress anyone who has ever had it and they always keep wanting more. So much so that someone actually asked me to marry them :P So here’s my version of the recipe! Recipe from Sanjeev Kapoor with minor adjustments. Let’s start off by Hanging our Curd :) Here’s how to do it. Place a thin cloth, preferably muslin, folded and then over another medium sized bowl. Add 1 cup of curd. 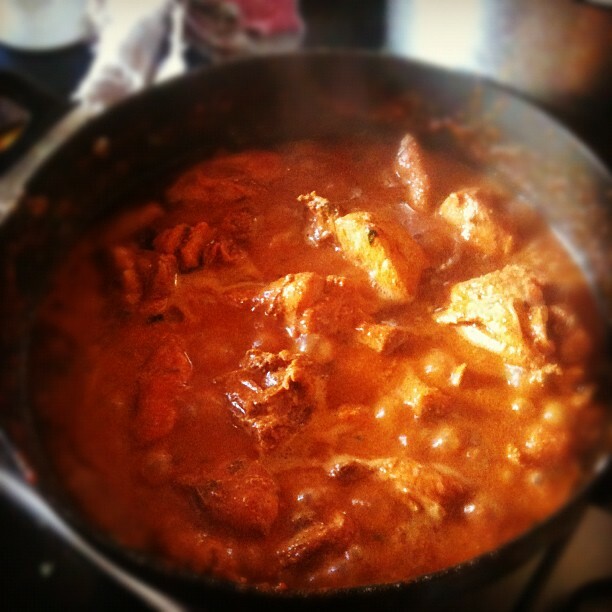 Now put his curd over your chicken along with all the other ingredients for the marinade, and mix away! I like using my hands so that the marinade gets everywhere and is coated properly. I’d like to make a note here about the Chicken, if you get boneless variety then get them cut into bite sized pieces from the butcher, else I recommend bigger pieces. I like the Chicken cooked bone in, has way better flavor, plus I am not working at a restaurant so bones are really okay! Anyway so keep this chicken in the refrigerator for about an hour to 90 minutes. Preheat your oven to 200C/400F. Transfer the marinated Chicken to a baking dish and cover with foil, and cook for 15 minutes. Then remove the foil and cook for an additional 2 minutes. Now, on to the gravy. Heat up the Oil+Butter in a deep pan on medium high. Once the butter is melted, add in the Whole Garam Masala and fry for 2 minutes. Then add in the Ginger Garlic paste and chopped Green Chilies. My Ginger Garlic paste looks green coz I make it at home with some coriander leaves too! Fry this for 2 more minutes. Now add in the Tomato Purée, Red Chili Powder, Garam Masala Powder, Water and Salt. Turn the heat to low and let it simmer for 10 minutes. Add in the Sugar and Fenugreek Leaves, and let simmer for 5 more minutes. Then add in the Chicken pieces + Leftover marinade. Let this cook for 5 minutes. Finish off by adding the cream, but remember to save some (2 teaspoons) for garnish beforehand. Mix and garnish with Coriander Leaves, A knob of butter and drizzle some cream! Serve with Hot Roti/Naan/Paratha or even Rice! This recipe will not disappoint you, I promise.